Key Question: What do you know about Africa? What does it mean to you? Learning Objective: To discover what we ‘know’ about Africa. Learning Outcome: The generation of a list of comments about Africa. Class discussion: Explain to the children the whole school topic for this term- the Olympics. Which countries will be competing? Have any children been to these countries? If not mentioned ask if children know anything about Africa. Explain we are going to be finding out about this country. Activity: Children to think of anything they know about Africa and share it with their talking partner. Encourage good listening. Partners report back verbally what they have been told. Teacher scribe comments on whiteboard and save for future discussion. Where next: To locate Africa. What does it look like? Key Question: What do you think Africa looks like? Class discussion: Remind the children of their previous comments about Africa. Do they want to add anything else? 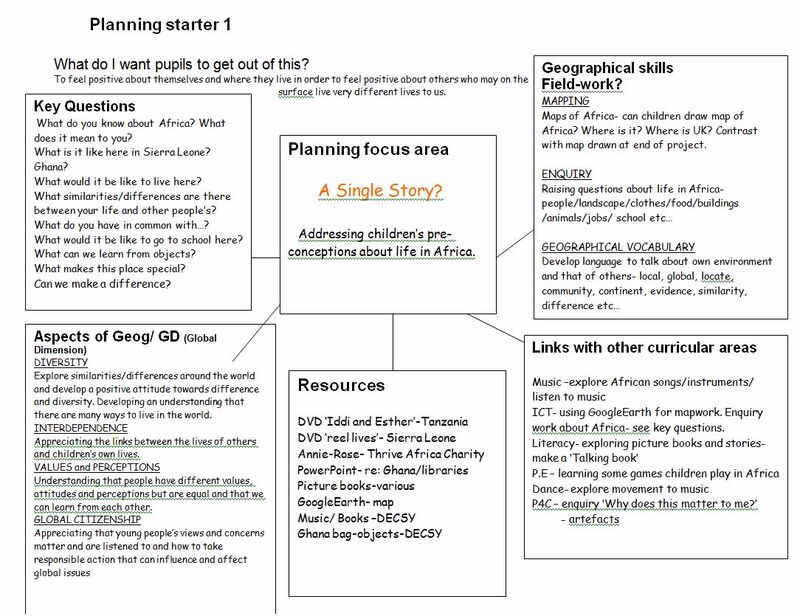 Activity: Invite children to draw a detailed map of Africa including drawings/labels of what they think it is like there. Plenary: Children show maps and discuss. Show children on Google Earth/ globe/world map where Africa is. Locate UK. Explain that Africa is a continent. Name some countries including Ghana. Are we seeing evidence of the single story? Key Question: What is this photograph telling me? Show children photograph of African children in uniform in their playground on IWB. Give individual thinking time (use 1 minute timer). Children in 3’s to make a talking triangle and come up with one question. Listen to questions and teacher scribe them on large sheets of paper. Encourage children to look for links. Teacher reads out questions and children vote using a coloured cube to show which question they would like to discuss the most. This is the building section-the most important part of the enquiry. Children use visual cues to partake in discussion (showing palm of hand to speak, showing thumb up/down to agree/disagree). Plenary: Final thoughts about discussion. Praise thinking time/speaking/good listening/turn taking. Do you now know what other people think about….? What did you discover? What were children’s perceptions? Is there evidence of the single story? Key Question: Are there similarities between our life and Shawn’s? Learning Objective: To build a familiarity and engagement with other people’s lives. Learning Outcome: To know that Shawn and his life is not so different from their own. Class discussion: Explain they are going to watch a video about a boy called Shawn who lives in Sierra Leone. Find Sierra Leone on globe/map. Ask children what they think Shawn’s life will be like? Teacher scribe comments and perceptions and save for further discussion. Activity: Show children the first part of the Reel Lives video ‘Sierra Leone’- featuring Shawn. After video give children time to talk in talking partners comparing their life to Shawn’s. Teacher scribe comments, noting any changes in perceptions. Plenary: Has anything surprised the children? What do they think now about life in Sierra Leone? What about the single story now? What similarities have they in common? Key Question: What things do you have in common with M’balou? Learning Objective: To compare their life to M’balou’s. Class discussion: Before showing the video tell children M’balou comes from the same place as Shawn. Ask the children to comment on things which they might have in common with M’balou and scribe and save for future discussion. Activity: Show video of M’balou’s life. After video allow time for children to discuss video with talking partners or in triangles. What differences did they note between Shawn and M’balou? How are our lives the same as theirs? In pairs (maybe mixed ability), one child interviews their partner acting as M’balou. Responses should only be based on what they have seen. Remind children of types of questions they could ask-refer back to previous sessions. Plenary: Share some ‘interviews’. Has the video shown some surprising similarities to aspects of life here in UK? What differences did you find between Shawn and M’balou? What do you think about those differences? Investigate another African country such as Ghana. What is life like there? Key Question: What can we learn from looking at and handling objects? Learning Objective: To introduce objects from Ghana to arouse curiosity about what they are. Learning Outcomes: We know what the objects are and how to use them. Class discussion: Show children the bag containing the objects from Ghana. Take out objects one by one. Encourage children to think about what they might be and what they would like to know about them. Activity: Use a selection of the objects and spread them out around the classroom. With each one, put a large piece of paper and two different colours of sticky notes. Children move around the objects and for each think of one thing they know and one question they would like to ask. Write these on sticky notes. Key Question: What was school like for Bridget in Cote d’Ivoire? Learning Outcome: We will be able to compare Bridget’s school with our own. Class discussion: Remind children that Bridget is from Cote d’Ivoire and locate country on map of Africa. Locate Ghana –which is ‘next door’. Share previous questions that children generated and discuss briefly. Challenge children to generate open ended questions that have been taught in previous Literacy lessons. Which words can we use as sentence opener? Activity: Children to make talking triangles and generate some questions to ask Bridget. Write questions and bring back to discuss which will be used. Can they change questions with yes/no answers? Ask for volunteers to interview Bridget. Practice reading and delivery of questions chosen. Class view video clips and discuss information gathered and look for similarities and differerences. Are there any surprises? Check for single story. Key Question: Can we make a difference to some children in Ghana? Learning Objective: To be aware of the needs and lives of others in the world. Learning Outcome: We can help by donating unwanted books to raise money to send to Ghana. Class discussion: Remind the class where Ghana is and recall what they have learned so far. Annie to show PowerPoint and answer any questions children may have about her proposed trip to Ghana with Thrive Africa charity. Discuss what a charity does and why. Explain how children can help by donating unwanted books and taking part in a raffle for story books set in Africa. Activity: Bring in unwanted books and take part in the Bring and Buy book sale in the school hall. Take part in the raffle. Plenary: After the Bring and Buy tell children how much was raised and remind them where their money is going and why. How do children feel after doing this? Will it make a difference? Why? Explain Annie will be back in the Autumn term to present another PowerPoint showing what she did in Ghana and how the money raised was spent.